Kyle Michel has won the Dunes Medal with a 2-over-par total to beat Blake Proverbs by a stroke at the Dunes Links south of Melbourne. Simon Viitakangas, Darcy Bremerton and James Grierson finished in a tie for third position at 5-over-par with David Micheluzzi two stroke behind in 7th position. 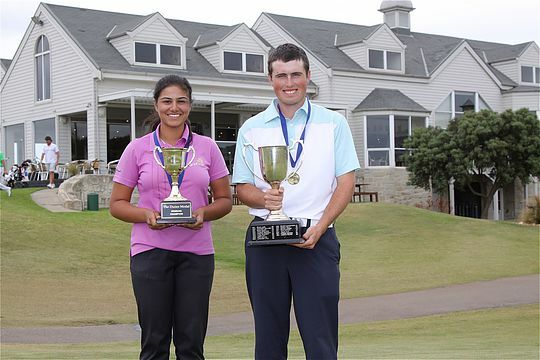 Michel was medallist at this year’s Queensland Amateur having also won the Traralgon Junior Classic earlier in the year. 19-year-old Michel, who hails from Shepparton Golf Club where PGA Tour player Jarrod Lyle also honed his skills as a junior, fired rounds of 72-67-73-78, with play suspended during the second third round due to strong winds. In the women’s section Hira Naveed cruised to a nine stroke victory over Genial Goodwin, with Karis Davidson, Hannah Green and Joanna Charlton sharing third position. The Dunes Medal has a fine history in amateur tournament golf with Jason Day and Rory McIlroy both former competitors. Day won the title in 2005 with a 12-under-par total. More recent champions have included British Amateur champion Bryden Macpherson (2008), Todd Sinnott (2011), Brady Watt (2012) and Jarryd Felton (2014). Alistair Presnell and Macpherson hold the tournament record of 14-under, with Presnell winning the title in 2003.